Translation is the most valuable asset available to you if your business hopes to succeed abroad. Market research shows that an overseas consumer is significantly more likely to engage with your products if they are presented in their language, this means a focused effort to tailor information to specific markets can pay huge dividends. K International provide a comprehensive set of translation services geared to individual sectors to help you start making the most of these potential markets. Effective communication with your customers is key to a businesses success. This needs to be considered for all customers, not just those that speak a different language. K International provide several services designed to make your existing material more accessible, allowing you to properly engage with the visually and hearing impaired, or even those with learning disabilities. We can identify ways of building trust in your organisation and meet these specific consumers communication needs. Interpreting services enable you to communicate with overseas speakers in real time. The benefits of this in business can be limitless, from meetings to customer service, being able to communicate effectively can quite simply be the difference between success and failure. K international’s professional interpreting capabilities are relied on by the UK government and numerous corporations when quality is a paramount concern. Often the need for an interpreter is sudden and cannot be arranged in advance. For those situations we have a specialist 24 hour telephone interpreting service, this enables our customers to communicate exactly when they need to, wherever they are in the world, at a moments notice. What’s more it’s completely free to set up and you only pay for the time you are connected to an interpreter with no minimum call charges. Relied on throughout the UK government, including the entire Home Office, the National Crime Agency and the Competition and Markets Authority. K International’s dedicated multilingual transcription department handles work in both domestic and international languages. Operating under high security protocols with rapid response times, we provide our clients with a service that is second to none for quality and reliability. Getting your content translated is the first step, ensuring it looks the part and retains your brand message is the next. 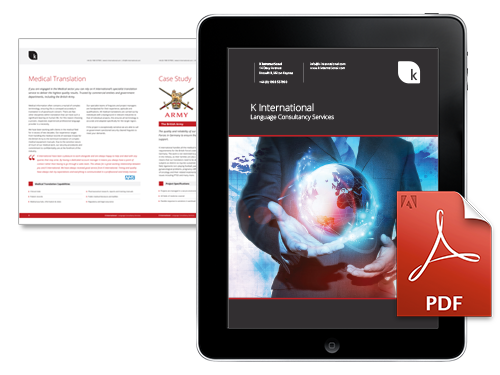 K International’s skilled team of DTP specialists are trained in the art of multilingual typesetting and design. This allows our clients to reduce the work load on their own design teams, who may not have the necessary experience to deal with the complexities of working with foreign languages. Our language, design and technology solutions have been relied on by corporations and numerous departments within the UK Government since 1986. Operating in more than 150 languages in every conceivable industry, our broad experience and commitment to quality is reflected in our clients. They share the belief that great communication is the basis of international success, whether that’s through language, design or brand awareness. Within our brochure, you will see examples of our services alongside a number of case studies detailing how we have helped our clients.